Inspired by Louise Bourgeois and Keith Haring with a bright and vibrant colour palette equals Paper London’s spring/summer 2013 collection; it’s refreshing piece of a physical art form ladies! I’ve been looking forward to blogging about Paper’s collection for a while now , since on the blog its becoming into a more masculine mood due to the London Collections: Men and before Milan menswear comes down the runway I thought we would break the wintery ice from the AW13/14 season. Focus on the spring/summer 2013 collection for you ladies. Starting off with the classic cream colour palette Paper is giving you the statement staples with the summery twist. From a refreshing neutral palette for a suit made up with Paper’s classic skinny trousers, shirt, and coat featuring a statement pattern to contrast with the cream. Staying with the trend of graphic prints Paper does through the classic dressers from floor length, long sleeved, high necked to knee length. All combined with the colour palette of yellow, black, white. 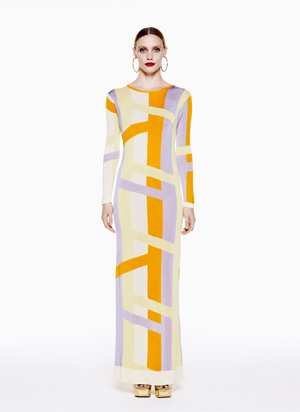 For the floor length you can dazzle yourself with lines of yellow and grey upon the cream background. 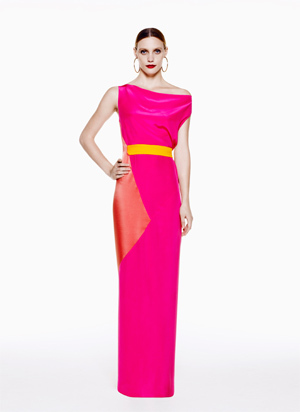 Or be bold with colour blocked yellow knee length dress whilst, choosing the neckline from a sweetheart to a high neck. Cinch in your waist ladies with Paper’s classic dressers featuring beautiful panelling of pattern amongst the constructed bodice of the dress in the colour palette of light purple, classic black and white graphic lines and vibrant pink. From dressers the skirts and trousers are so making a statement for the SS13 season, from their appearance of being high waist tucking in Paper’s classic shirts which feature beautiful intricate detailing from buttons to the pattern upon the collars and the front of the shirts. Coming short or long sleeved... 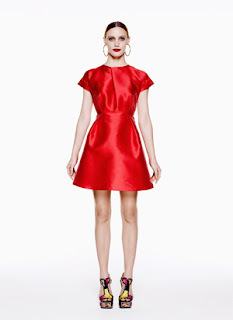 It serves you with boardroom statement staple ladies! Sweetheart of pinkness makes a bold statement within the collection from a classic baby pink sweater, a strappy number for a dress, whilst being elegant for a floor length dress featuring Paper’s use of colourful statement graphics. (Which I love) Following a statement in a red dress... Paper has created a swimsuit for your holidays featuring their famous statement graphics for this collection. Overall Paper’s spring/summer 2013 collection is a rainbow within refreshing staples within your closet ladies, with their exquisite tailoring and detailing to make it an easy transformation for you to make a statement with your staple pieces within your closet ladies. Are you ready to make that transformation?